The Burgwin-Wright House and Gardens has offered programs for the public since opening its doors as a museum in 1951. Currently the museum offers four major programs. They include the following: “People of the Past,” Fourth Friday Gallery Nights, and a lecture series. In 1952 The Burgwin-Wright House and Gardens began offering fieldtrips to select schools. This ritual eventually morphed into “The People of the Past.” This program holds the spot as the oldest ongoing program at The Burgwin-Wright House and Gardens. In the 80s it evolved into a program that correlates with the curriculum of fourth grade history. 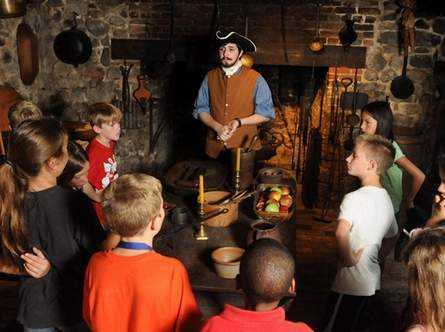 All fourth graders in New Hanover county, learn what life was like during the Colonial era from the perspectives of: enslaved people, women, workers, and wealthy businessmen. This program serves about 1400 students annually. Museum director, Ms. Christine Lamberton oversees the programs department. According to Lamberton after the restoration and stabilization of the house, there will be more energy put towards programming. She wants to offer a variety of hands on programs, have a Colonial Fair Day, and develop programs for adults.